This is a reposting taken from Joro, The New Beginning. 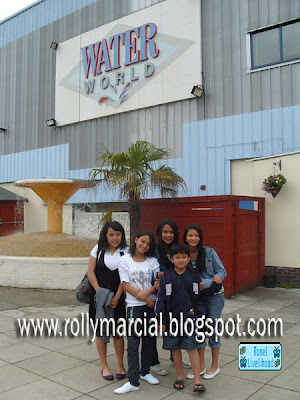 Last Summer Bank Holiday, 25th of August 2008, the Northfield Filipino Community went to Waterworld in Stoke On Trent, Staffordshire for a day fun trip. Mayette Rivera and Hams Masuhud had organized the trip and they hired a coach in going there. We went there at about 830 am assembling in Sainbury's supermarket in Northfield. And guess what? Bacon was also there. 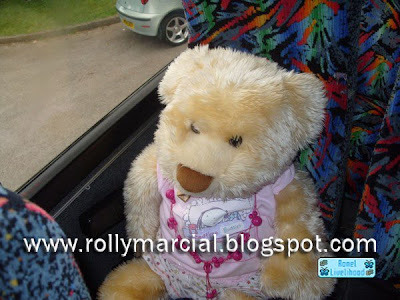 I put her in the bag and set her free in the coach with Pauline, Shereen and Charmaine looking after her. That was her first time to be in the outside world. They all amused of her cuteness and beauty. As I got into the bus, I noticed that I saw new faces. I really didn't know them but anyway, whoever they are, they were a great help to reduce our fare. We arrived there 45 minutes after and the gate was still shut, so waited for the doors to open. In the meantime, me and Bacon had some photo taken by Pauline and it seems that Bacon was so proud and happy that at last, she is free to see the world. But unfortunately, I was not taking the risk of drowning her, that's why, I just let her to stay in the bus with the driver. 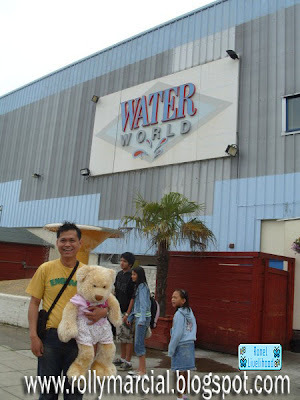 WaterWorld attracts over 400,000 visitors a year making it a leading visitor attraction in North Staffordshire, and the UK’s No.1 aqua park. 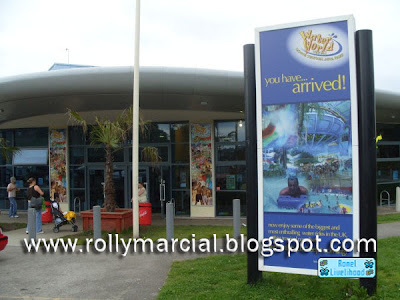 Water World is the UK's number one Tropical Indoor Aqua Park. 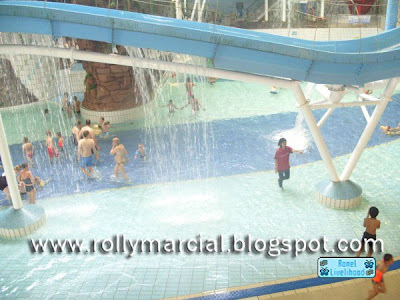 The Facility is built around a wave pool with slides, rides, flumes and features available. There is plenty to do for all ages, weak and strong swimmers. 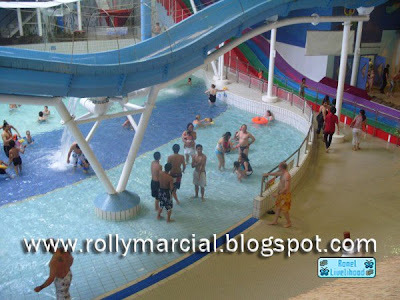 There are so many rides that suits your fighting spirit like the nucleus, black hole, twister, aqua splash jungle house, assault course, the pythoon, rapids, space bowl, super flume, water cannon, wave pool and multislide. 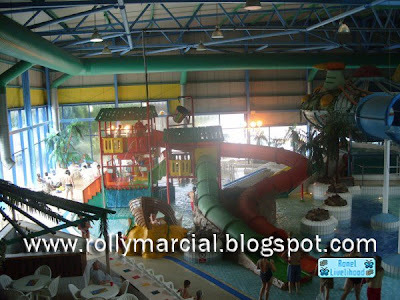 When we went inside, for those not going to do swimming, they went to the spectators area and the parents dragged their children to the pool. I joined the fun later on but I was so hesitant to go further or to swim as I was trying to protect my contact lens from water. I forgot to buy my goggles. The water was warm and it really suits for swimming. That's my lovely Bacon, sitting pretty on the ground. I love you Bacon. By 1pm, we went outside and had our lunch together picnic style near our bus. Bacon joined us. There were so many foods laid on the ground and I joined Arleen adn family with their food. Bacon was also with me and relaxing. In there were me, Mayette, Brendo, Pauline, Mikoy, Akring, Johnna, Charmaine, Renzo, Cyrus, Zaldy, Zamil, Jono, Josh, Macy, Dante, Mayumi, Raya, Rikki, Madel, Alfred, Searjohn, Earlsean, Arleen, Jogie, Isabel, Imelda, Isabel, Salve and son, Alma, Luis, Louie, Sheila, Wilmer. After lunch, we went back inside and I continued swimming. We went home by 5 pm. I sat beside Bacon of which she had some fun. We arrived in Northfield at about 545pm. I took some rest then I went to Zaldy's house as Wilmer had called me for a drink. Wilmer's birthday was the day before. He decided not to celebrate his birthday kay medyo kuripot na tao. I never stayed there longer and I went home at about 1030 pm because Jojo was waiting for me in the chatroom. Mahal ka talaga ng daddy mo Bacon. Ang cute mo talaga.